Make the most of your space! The dedicated team of experts at More Space Place will provide you with the perfect custom storage solution – from wall beds, custom closets, home offices, and more! 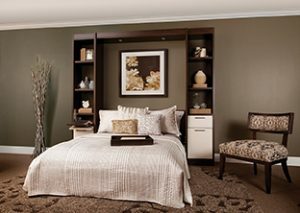 As America’s #1 Murphy bed distributor, our skilled designers will help you transform your space with a high-quality wall bed. Create the perfect space-saving solution with an efficient, stylish, and comfortable Murphy bed. Customize your bed with modern shelving, elegant bookshelves, and more! Our custom closets will bring you a storage solution tailored to your lifestyle. We offer both traditional and modern designs, with a variety of real-wood finishes. From custom cabinets to walk-in closets, we’re happy to bring you the perfect storage solution! More Space Place Houston can help you make space for your dream home office. Transform any room into an area where you can channel creativity and productivity. Personalize your space with custom-made furniture and organization systems with our team of expert designers! For every area of your home, we have a custom storage solution ready. For your kitchen pantry, home office, spare bedroom, and more, we’re ready to provide you with the perfect organization system and storage solution. Get in touch with our team today! At More Space Place, we collaborate with you to create a storage solution tailored to your life. Our expert design consultants will work with you to find the perfect storage solution. Utilizing 3D software programs, we can help you design your dream office, bedroom, kitchen, and more – and then turn that dream into a reality. Visit our showroom to learn more about our product, or schedule a free estimate with our team of designers today! Your storage solution is crafted independently before installation. Once ready, our team of experts will install your storage solution and ensure your total satisfaction. Check out our customer gallery to see some of our work! Contact us today for your Houston Murphy bed, wall bed, or custom closet system needs!